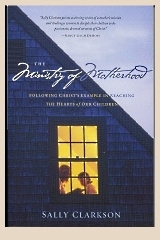 I recently read a book that, in light of my impending motherhood, should be on my reading list yearly if not more. Its a few years old so perhaps many have already read it, but at the chance that some hadn't, I thought it was good enough to share. In my own preparation for the tornado that motherhood is about to bring me, much of the information and conversations are on childcare, as in diapers, furniture, discipline, and so on. There is less talk about the spiritual lives of children and what I can do outside of "set a good example" or "teach them the love God", which, by the way, I expect are core principles to parenting. The difficulty is that it rarely goes further than that. How do you set the right example and how do you teach them to love God? The great thing about this book is that, to me, it showed me several ways to just that AND kept parenting in a healthy perspective. We are expected and commanded to give good gifts to our children. Clarkson shares her desire to make sure those gifts weren't just physical things and what she came up with. Below are the 5 sections of the book and within each section are approximately 4-5 chapters that go into detail about how to give that gift. Ultimately, the book is a mother sharing stories about her own children and what they've learned from each other, but every section was full of things I either hadn't thought of or was not remembering long enough to practice it in my life. It is sold on Amazon.com or you can save money like me and borrow it from your local library!